There are more than a dozen species of rabbit found in North America. 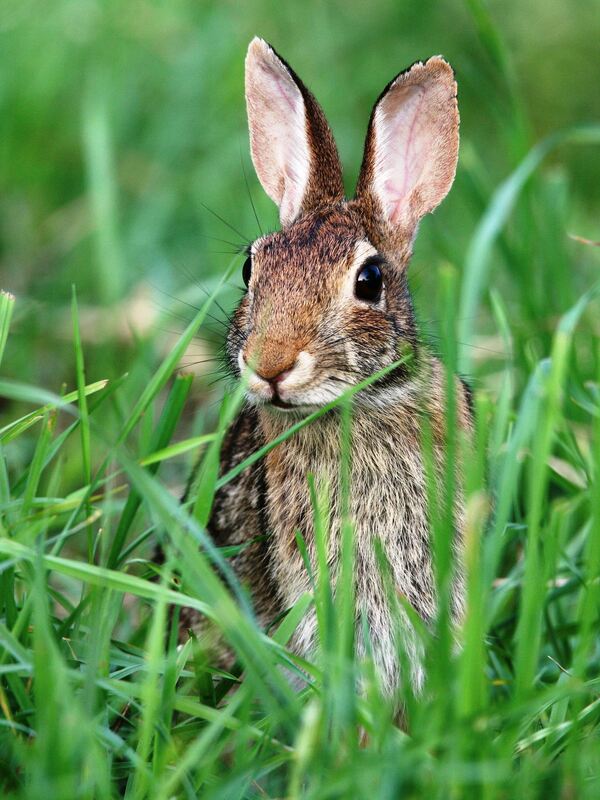 The most common in the eastern part of the United States is the eastern cottontail. Two similar cottontails that occur in the east, Appalachian cottontail and New England cottontail, are more prevalent in high elevation young forest areas. Eastern cottontails are most often found in suburban backyard habitats, brush piles, edges of fields in farmed areas, brushy fencerows, cemeteries, open woods with a brushy understory, and roadsides. They rarely inhabit dense forests and extensive grasslands. Rabbits eat flowers and vegetables in spring and summer, and gnaw bark and clip off low growing woody branches in fall and winter. Cottontails prefer plants in the rose family, and also raspberries, blackberries, apple trees, maples, sumac, and dogwoods. Gnaw marks on woody stems and clean cut, angled clippings of young stems up to twenty inches above the ground are evidence of rabbit damage. Cottontails use natural cavities and abandoned burrows for denning and escape cover. They are most active at dusk, dawn, and during the night.